Reported last November, Booster Gold is on track to make his live action TV debut and it’s getting ever so closer. In an interview with IGN, writer Andrew Kreisberg offered up some info about how the project is coming along. Check it out below. 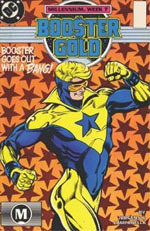 Created by Dan Jurgens in 1986 and featured in his own eponymous series, Booster Gold is the superheroic identity of Michael Jon Carter, a resident of the 25th century who travels back in time to the present day DC Universe. There, he makes use of his futuristic technology to become a hero, at first eschewing traditional heroic notions of justice and nobility and instead signing endorsement deals and shamelessly self-promoting.